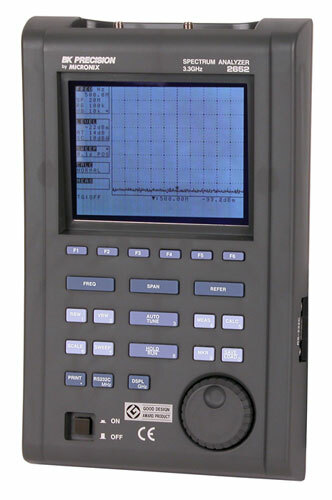 Model 2652A has the same feature set as the 2650A handheld spectrum analyzer, with the addition of a 5 MHz to 3.3 GHz tracking generator. B&K Precision's 2652 handheld spectrum analyzer is small and exceptionally light weight, yet delivers performance and features comparable to a full size bench spectrum analyzer. The 2652 is a 2650 with a tracking generator added and can be used to rapidly determine transmission characteristics of two-port RF devices. With its ease of use, great performance and broad functionality, the 2652 is an ideal tool for engineers and technicians who perform field measurements in the 50kHz to 3.3GHz range.